If you’ve lived on Earth for a while and watched the news you periodically hear of a religious group prophesising the end of the world. Those ends come and go and life goes on. So we have become used to these false prophesies and ignore them often with a laugh. When we hear of large asteroids or comets approaching the Earth we are a bit more concerned as we rely on the scientists to carefully calculate the orbits and advise us that we are in no danger. What then is our response when many climate scientists predict doom in the near future unless we act to stop it? In the case of the religious prophesy we can argue that it based upon a supernatural belief which cannot be backed up with empirical scientific evidence so it is easy to disbelieve. In the case of the asteroid we trust that the mathematical calculations are correct and every year as a big asteroid passes nearby we are thankful that it missed. Since we can’t do anything about it we don’t worry and life goes on. The scientific prediction of global warming doom is a little different; it’s like being diagnosed with cancer. You trust that the doctor’s diagnosis is correct because it’s based upon scientific measurements. At first there is denial, you ask whether it can be cured and if it can then you seek treatment and that treatment becomes the most important thing in your life. If there is no treatment you must accept it and you ask how long you have got left. That’s human nature. Spaceship Earth’s life support system has been diagnosed by the scientists to have a life threatening problem. Many have accepted the diagnosis and have asked whether it is fixable and the scientists have said yes it is fixable but you will need to make some changes that will affect your lifestyle. This has scared many people as they don’t like the thought of change. It will cost money, resources and take time and effort. It will inconvenience them, they might lose money so they deny the problem. They argue that it won’t affect them in their lifetime so why do anything. Even worse in some cases they try to hinder or stop others from trying to fix the problem. Last year I wrote a doomsday scenario blog where the ocean became warm enough to release MASSIVE amounts of the greenhouse gas methane from under the shallow waters in the Arctic. (see here and here and here). We’re talking about enough carbon to cause the Earth’s temperature to increase by more than 10 degrees Celsius quickly, this century, in your life time. Scientists agree that this scenario will destroy most life on space ship Earth. What if new scientific evidence showed that the breakdown of the Earth’s life support was happening much faster than anyone had guessed even a few years ago? 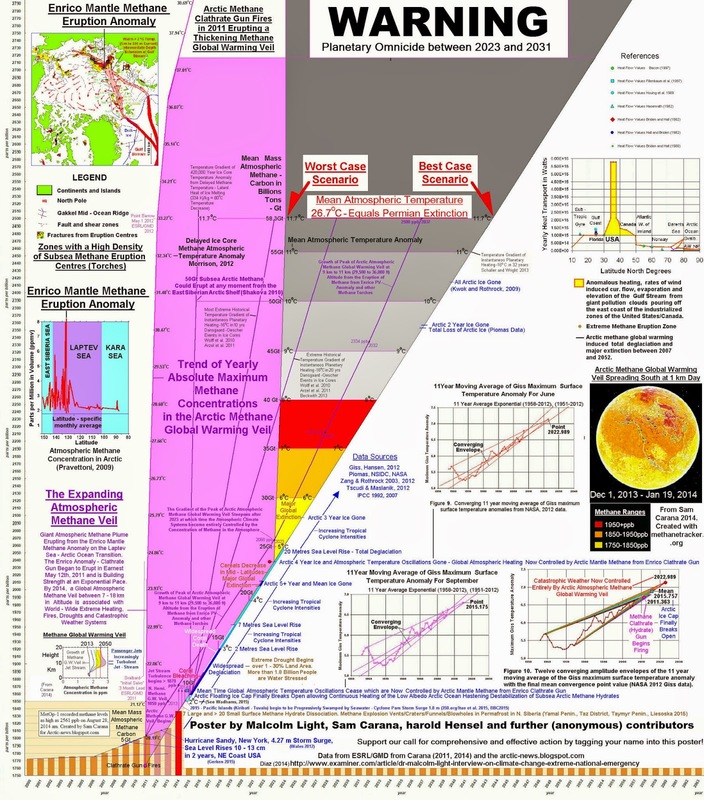 What would you do if you found out humanity had only a decade to fix the doomsday methane release scenario before an irreversible tipping point was passed which would doom us all. What would you do? After I wrote that article I decided to chase up more information for a future article like this one you are reading now. I am a scientist and I WAS SHOCKED at what I found. Last Arctic summer the water temperature was the highest ever measured at up the 16C in the Arctic where there are massive amounts of trapped methane hydrate waiting to be released. Massive plumes of methane over a 150 km wide have been reported and projections of further releases are expected in the Arctic summer this year. A group of over 20 scientists have been watching the problem and are now scared witless themselves. This is what Dr Malcolm Light, one of the earth scientists that are studying the Arctic methane release wrote a couple of weeks ago on my Facebook page. Link to the Des Pensable Internet site for more stories.